Take the stress out of investing with this revolutionary new strategy from the author of The Neatest Little Guide to Stock Market Investing, now in its fifth edition. In today’s troubling economic times, the quality of our retirement depends upon our own portfolio management. But for most of us, investing can be stressful and confusing, especially when supposedly expert predictions fail. Enter The 3% Signal. Simple and effective, Kelly’s plan can be applied to any type of account, including 401(k)s—and requires only fifteen minutes of strategizing per quarter. No stress. No noise. No confusion. By targeting three percent growth and adjusting holdings to meet that goal, even novice investors can level the financial playing field and ensure a secure retirement free from the stress of noisy advice that doesn't work. The plan's simple technique cuts through the folly of human emotion by reacting intelligently to price changes and automatically buying low and selling high. 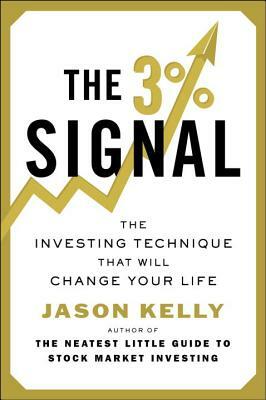 Relayed in the same easy-to-understand language that has made The Neatest Little Guide to Stock Market Investing such a staple in the investing community, The 3% Signal is sure to become your most trusted guide to investing success. JASON KELLY is the author of nine books, including The Neatest Little Guide to Mutual Fund Investing, The Neatest Little Guide to Stock Market Investing, and The Neatest Little Guide to Personal Finance. The Neatest Little Guide to Stock Market Investing, now in its fifth edition, is a BusinessWeek best seller. He conducts seminars on money management and can be seen as a frequent guest on CNN's financial network. He lives in Japan.